Sometimes you just have to cheat. Anyways, despite my shortcuts, these were pretty good. If you can grill them though, do it. 1. Cut meat into sixteen equal pieces. Combine all ingredients and marinate the chicken in it. Grill over medium heat (2 minutes per side for the fish, until the juices run clear for the chicken). Grill the tortillas until they have grill marks (15 sec per side). 1. Combine all the ingredients. Allow the mixture to marinate for 30 min (up to 8 hours). 1. Combine all the ingredients and mix well. This can be used immediately or stored in the refrigerator for up to two days. 1. Combine all the ingredients and mix well. Use immediately or refrigerate up to 2 days. 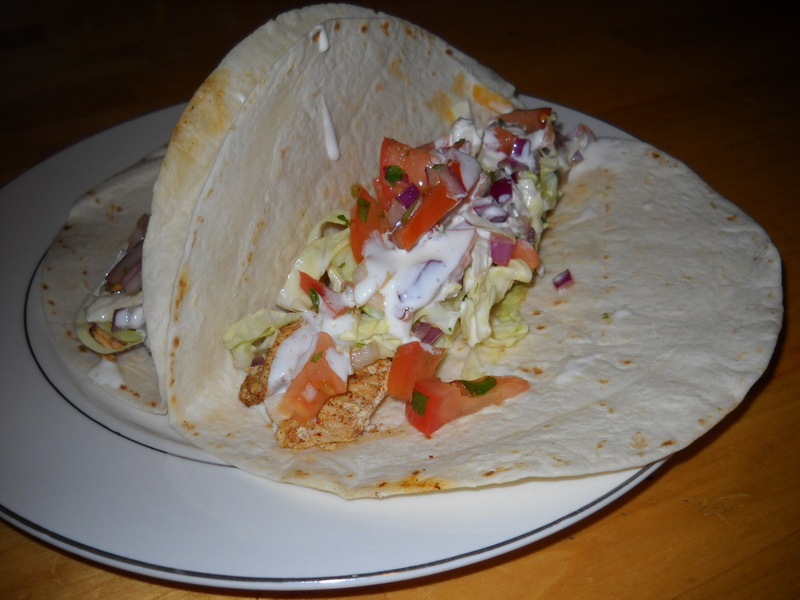 To assemble the tacos, put 2 slices of chicken or fish in each tortilla. Top with Southwestern Slaw, Chipotle Pico de Gallo and drizzle with Mexican Crema. This entry was posted on October 28, 2010 by sanozababydesign. It was filed under Mexican, Poultry, Salads and was tagged with Barbecue, Cabbage, Chicken, Chipotle, Fresh Salsa, Grilling, Limes, Mexican, Pico de Gallo, Recipe, Southwestern Slaw, Tacos, Tomatoes, Tortillas.